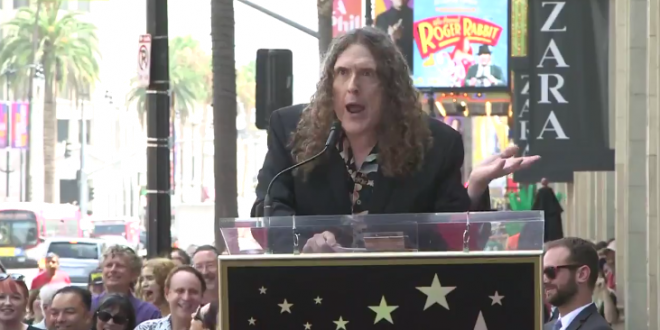 Weird Al: Please Don't Pickax My New Hollywood Star, Unless I Do Something Monstrous And Evil [VIDEO] - Joe.My.God. “I’m sorry I even have to say this, I don’t want to even have to ask this, but please don’t pickax my star, okay guys? I know it’s all the rage these days, but that’s not cool, just please don’t do that. Unless, at some point in the future, I do something unfathomably monstrous and evil, in which case, sure, fine, go ahead, makes sense. But anything short of that, please limit yourself to spitting and urinating.” – Weird Al Yankovic, at yesterday’s unveiling of his Hollywood star. Weird Al has sold 12 million albums and won four Grammys out of 15 nominations. His 1989 movie UHF has become a cult classic.